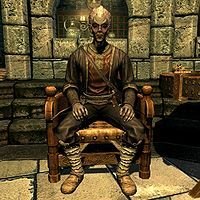 Drevis Neloren is a Dunmer sorcerer and an instructor at the College of Winterhold. He is the master trainer for Illusion, able to train you to level 90. After you officially become part of the College, he will ask you to don some magical gloves for a quest where you have to cleanse various magicka focus points around the college. He will also give a quest for the master Illusion spells, and will sell many Illusion spells. Drevis wears master robes of illusion and a pair of boots, and carries an unenchanted iron dagger. He can be found during most days in his room on the lower floor of the Hall of Countenance, waking at 7am to eat, drink, and perform alchemy for most of the day with the exception of between 10am to 3pm, during which time he will be found in the Arcanaeum. He will then go to sleep at 11pm. Upon first meeting Drevis, he will be surprised that you are talking to him, and say: "You... You can see me?" You can either deny this, and he will say: "But you can hear me, obviously. Something still isn't quite right. At least I'm making progress." or, you can tell him the truth, which will make him say: "Confound it all. I was quite sure I was invisible, or at least transparent." If you ask him which are the best Illusion spells, Drevis will be intrigued and say: "Oh my, that's quite a difficult question. Never underestimate the ability to influence others. Whether they're friends or foes, they're almost all susceptible to Illusion spells. They can turn the tide of a battle in a moment's notice. There are also spells that help in avoiding conflict altogether. Invisibility is tricky to master, but exceptionally useful." Upon finishing a conversation with Drevis, he will sometimes say, "If only I could be free of the mundane, day-to-day activities life so often requires. ", "Illusion really is the least appreciated of the schools of magic. ", or, "You know, they say knowledge is its own reward." Urag: "Are you looking for any specific volumes, Drevis?" Drevis: "Hmm? Oh, no. No, not really. I... Actually, I've forgotten what I was looking for." Urag: "Ah. Well, then. Let me know if you need anything." Drevis: "What's that? Oh yes, yes. Thank you, I will." During the quest Containment, when Drevis learns that there are magic anomalies attacking Winterhold, he will say to himself: "I hope this isn't something I did." After the quest, he will occasionally say in passing: "Have you seen Mirabelle around? I know she's dead, but I thought... Well, I thought she might stop in and say hello anyway." After you defeat Ancano and the Eye of Magnus is removed from the College, Drevis can be heard saying: "The Eye of Magnus. Here, but lost. Slipped through our grasp. Oh, what we might have learned." as well as: "I wonder what we could've done with the Eye, had it been put to better use?" Once you have become the Arch-Mage of the College, Drevis will occasionally say: "We have survived difficult times, and are better mages for it. We owe you that, Arch-Mage. Thank you." "I'm busy right now, Colette." 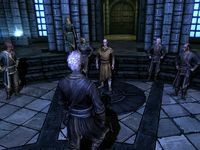 After becoming officially inducted into the College of Winterhold, you can ask Drevis if there is anything he needs help with. He will say: "There may be a matter in which your... skills... could be useful. The various points of focus for magic energies around the College have become polluted, and need cleansing." If you ask him to elaborate, he will say: "As you may be aware, the College has gone to great lengths to purify and enhance the natural energies of the world. This both enhances our connection to the realm of magic, and eliminates possible interference from outside sources. These energies, on occasion, become... polluted. Effort must be made to see that they are kept pure, clean. Do you wish to aid in this cleansing?" 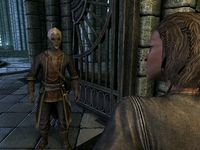 If you agree to help, Drevis will hand you a pair of mystic tuning gloves and say: "Very well. These specially enchanted gloves will allow you to delve directly into the focal points for these energies. Go to each focal point and remove whatever impurities you may find there. Return the gloves to me when you have finished. Please exercise caution. This is not a procedure without possible... consequences." Returning to him without finishing the task and asking for clarification will make him say: "Use the gloves to clear the focal points. Return to me when you have finished. I thought I made this rather clear." Successfully cleansing all of the focal points and returning to Drevis to report that the focal points have been cleansed, he will say: "Yes, they have. I can feel the difference already. But of course, I'm far more in tune with these sorts of things than most. Thank you. I appreciate your assistance." If you tell him that you might help some other time, he will be terse and simply say: "I see." During the quest The Black Star, you can ask Drevis if he knows anything about the study of stars. He will say: "I know plenty of spells that produce light, but stars? Hmm. There was that problem a few years ago, but that couldn't be related." Pressing him further on the matter, he will say: "There was some bother about a group of mages being exiled. I can't remember what the details were. I think one of them came back. Nelacar. Stays at the Frozen Hearth, but I don't know why. He's not welcome in the College." "The existence of so-called 'Doomstones' throughout Skyrim has been repeatedly verified. The meaning of these stones has not. The prevailing opinion of Skyrim natives is that the stones are indeed magical in nature. While there is no direct evidence of this, it does seem likely. References to similar stones appear in lore throughout the various Tamrielic cultures. None, however, exactly match the markings or distribution of Skyrim's stones. At present, there is no confirmation of any of the various theories surrounding the nature of these stones. Their relative positions do not indicate that any individual stone is part of a larger, unobserved pattern. Also, their placement throughout Skyrim does not correspond to any known magical phenomenon. The age of the stones themselves has yet to be officially determined. It has been widely assumed that they were placed during the Merethic Era. Writings from that period, including those of Ysgramor himself, do not mention the stones and thus this idea cannot be verified. Nonetheless, many are drawn to these stones based on the local stories describing them as a source of significant power. The College will continue to research these intriguing objects, and of course any findings will be relayed with all possible haste." Once you reach level 100 in Illusion, you can ask Drevis if there is anything more to be learned about Illusion magic. He will respond with: "You have gone beyond my teachings, which is quite a feat. I did not think it possible. But there is always more to learn. I believe you are ready for the next step." Asking him about the next step, he will say: "Knowledge of truly powerful Illusion spells is here at the College, but it is hidden from those who might misuse it. I shall teach you a spell to discern things hidden from others. With it, you will be able to acquire the texts you need. Bring all four to me, and I shall use them to inscribe the spells for you." Upon acquiring all of the books and telling Drevis that you have them all, he will say: "Yes, very good. Here, then, is the first of the Illusion spells you sought." This is the merchandise found in Drevis's merchant chest. These items are only available if purchased from the merchant; they cannot be pickpocketed or stolen. They are restocked every two days. Despite being the master trainer in Illusion, Drevis does not know any Illusion spells. Drevis Neloren also appears in the Heroes of Skyrim card expansion for Legends, as the card Winterhold Illusionist. This page was last modified on 11 March 2019, at 21:54.